He was the first starting shortstop in New York Yankee team history. Peckinpaugh won the job in 1913, the same year the New York Highlanders officially became the New York Yankees. He kept that position for the next eight seasons, long enough to become the first Yankee starting shortstop to play in the old Yankee Stadium and also to play for New York in a World Series. He was a brilliant fielder, an excellent base runner and a fierce and volatile competitor. In 1914, when team skipper Frank Chance was fired with 20-games left in the regular season, New York made Peckinpaugh player/manager and the Yanks finished the season 10-10 under his stewardship. His lifetime totals in Pinstripes included 1,170 hits, over 1,200 games played, a .257 batting average and 143 stolen bases. In December of 1921, Roger was part a seven player swap with the Red Sox that included Boston’s starting shortstop, Everett Scott. By 1925, Peckinpaugh had been traded to Washington, where he hit .294 and was named AL MVP for leading the Senators to the World Series. But in that year’s Fall Classic against the Pirates, Peckinpaugh committed the unbelievable total of eight errors, which remains a Series record, today. 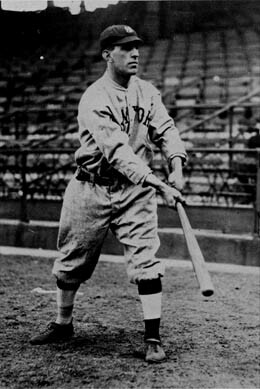 He ended his playing career in 1927 and re-started his managing career the following season as skipper of the Indians. He managed for seven seasons and then took a job in Cleveland’s front office. Roger died in 1977, at the age of 86. Number 1 – Derek Jeter: Five rings, eight pennants, seventeen postseasons, 3,000 hits. Simply the best. Number 2 – Phil Rizzuto: Ted Williams described Scooter as one of the greatest players of his era. Nine pennants, seven rings, an MVP and Hall-of-Famer. Number 3 – Frankie Crosetti: The starting shortstop on 6 World Championship teams. A total of nine pennants and eight rings as a player. Reached 1,500 hits and 1,000 runs during his career. Number 5 – Tony Kubek: His three rings, seven pennants and 1,109 hits during a brief nine-year career easily beats out Bucky Dent for the final spot. Also born on this date was this former New York receiver, and this one-time prized Yankee prospect. How long does it usually take you to find what you think is the best Yankee birthday for whatever the given date is? Do you decide a certain number of days in advance? Also, do you recycle birthdays from year to year? I created a spreadsheet with all the Yankee birthday information, which I maintain on an ongoing basis. I usually write a blog post or two late at night. During year 1 of my blog, I selected each day’s Yankee based on how long and especially how well they played in pinstripes. I do repeat posts from year-to-year, but I always add something new about the player so readers are never forced to read or see the same exact post twice. Thanks for writing Mateo. February 3 – Happy Birthday Larry MacPhail Sr.